Let me ask you that same question in a slightly different way, can you define what “enough” success looks like for you? 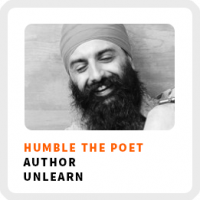 I’m thrilled to welcome Humble the Poet to the show for an in-depth discussion about how finding sustainable success in your career. I saw him speak at the Think Better, Live Better conference this winter. The soul searching way in which he described his self-employment journey as an artist was one I knew I just had to share with you directly! You might think of success as achieving a goal you’ve set for yourself. You might define success in terms of money or material possessions you want. More often then not, as you’ll hear from Humble, success has really nothing to do with goals or money. What we really want is to feel a particular feeling and that feeling can often be fleeting. Humble is a rapper, performer and author of the book Unlearn: 101 Simple Truths For A Better Life. He wants to help you unlearn what you’ve been taught about work and life to discover your unique version of success without burning yourself out! Why adding another comma to your net-worth is often not going to make you feel more fulfilled. The gap between the feelings you desire and the feelings you actually feel when you achieve milestones or accomplishments in your career. Follow the fun in your work, but come to terms with doing necessary work that may not be all that fun. Why career paths that seem safe and secure are no longer as safe and secure as we might think.